Going under anesthesia for surgery is generally considered safe, but it’s important to know the risk factors and side effects, as well as how to prepare for surgery. During surgery, the anesthesiologist and his or her team will monitor and manage your vital body functions and address any medical issues that may arise. The moment your doctor tells you that you’ll have to undergo a surgical procedure can be a frightening, confusing, and stressful experience. All kinds of thoughts will cross your mind—it’s natural to worry about the skills of your medical team, the operation’s outcome, and potentially high medical bills that will follow. But what might concern you the most is the thought of having to go under anesthesia. Anesthesia is the use of medicine to block or reduce the feeling of pain and/or sensation during surgery and other medical procedures. The medication can be administered via inhaled gas or injection by a highly trained medical professional such as a doctor, dentist, or anesthesiologist. Before going into surgery, it’s helpful to know how your medical team will use anesthesia and how it may affect your mind and body afterward. General: With this type of anesthesia, the patient is unconscious with no awareness or sensation. It is mainly administered through a breathing mask or tube, or intravenously. Regional: An injection is made near a cluster of nerves that numb a specific area of the patient’s body. He or she may remain awake or lightly sedated. This type is mostly administered through a spinal block or spinal epidural. Local: An injection is made into the tissue to numb a specific location of the body for short amount of time as prep for minor surgery, such as dental work or biopsies. How Does Anesthesia Actually Work? While all three types of anesthesia are administered to block pain and/or sensation, each type works differently. The medications used for local anesthesia, such as Novocain, block the nerve transmission to pain centers in the central nervous system by inhibiting the function of the sodium channel in the cell membrane of the nerve cells. Inhibiting the sodium channel prevents the movement of nerve impulses near the targeted area. Regional anesthesia works in the same way, except that the medication is injected in or near the spinal canal to block sensations from the arms or legs. According to Scientific American, the medications used for general anesthesia mainly affect the central nervous system by reducing the nerve transmission at synapses, which is where neurotransmitters are released. But how these medications actually inhibit what is known as “synaptic neurotransmission” is not fully understood. According to Medical News Today, general anesthesia can act on a number of sites within the central nervous system, including the thalamus, cerebral cortex, spinal cord, and reticular activating system. Before receiving surgery involving regional or general anesthesia, you may be instructed to refrain from eating or drinking anything after midnight before your surgery. Smokers will be advised to quit as soon as possible before the day of surgery. Unless you’re having local anesthesia without sedation, you will be required to arrange for a ride home after your surgery since you will not be able to drive yourself. Some medications that you take on a daily basis should be stopped before surgery, while others shouldn’t, so speak with your doctor before skipping any doses. Stage 1, The patient begins to feel disoriented shortly after the anesthesia is administered and begins to lose consciousness. Stage 2, also known as the “excitement” stage. The patient experiences excited activity following loss of consciousness, such as erratic heart rate, nausea, breath-holding, and pupil dilation. Stage 3, also known as the “surgical anesthesia” The patient’s muscles relax, eye movements slow down and then cease, and breathing becomes depressed. In this stage, the patient is ready to be operated on. Stage 4, also known as the “overdose” stage. Too much medication has been administered, leading to paralysis of the brain stem or medullary, and respiratory and cardiovascular collapse. The goal of the anesthesiologist is to bring the patient to stage 3 as quickly and safely as possible and to keep him or her there for the duration of the surgery. Before receiving anesthesia for your procedure, your anesthesiologist will review your medical history and laboratory tests with you, as well as answer any questions. Your nurses will record your vital signs and administer any intravenous fluids and preoperative medications, if necessary. Once you’re attached to any necessary monitoring devices in the operating room, you’ll be ready for anesthesia. During the surgery, the anesthesiologist and his or her team will monitor and manage your vital body functions and address any medical issues that may arise. After surgery, you’ll be taken to the recovery room, where your anesthesiologist will oversee your monitoring and aftercare. During this time, you’ll be monitored closely by specially trained nurses and you may be given extra oxygen to regulate your breathing and heart function. Depending on the type of surgery, some patients are ready to go home as soon as one hour after surgery, while others will be required to stay overnight. Your medical team will advise you to refrain from drinking alcohol, taking any non-prescription medications, operating a car or dangerous machinery, and making important decisions for at least 24 hours after surgery. 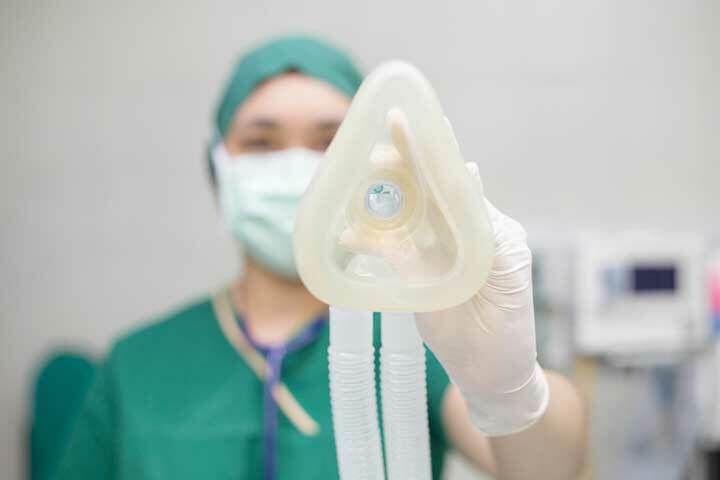 As mentioned earlier, older adults are at a higher risk of complications when receiving anesthesia because they’re more prone to having conditions such as heart and lung disease, increased blood pressure, and clogged arteries. But even if a senior doesn’t have any of these medical conditions, age itself can sometimes cause troubling side effects. Postoperative delirium, which causes confusion, disorientation, and attention and memory issues a few days following surgery. Postoperative cognitive dysfunction (POCD), which is more serious and can lead to long-term memory loss and cognitive decline. Patients who suffer from heart and/lung disease, Parkinson’s disease, or Alzheimer’s disease or who have had strokes in the past are at a higher risk for POCD. Bring a close friend or family member with you when it’s time discuss the surgery with your anesthesiologist so that he or she can take notes. Ask him or her to be there after surgery as well to help report any troubling observations to your nurse or doctor. Ask your doctor to conduct a cognitive test before your surgery, so that the results can be used for comparison after surgery. Ask your medical team to make your hearing aid and/or glasses available to you as soon as possible following your surgery. Request a recovery room with a window so that you can tell whether it’s day or night. Pack a few familiar objects from home, such as photos, a clock, and a calendar to help you mentally readjust. alcohol, allergies, alzheimer, apnea, blood pressure, brain, cardiovascular, central nervous system, cerebral cortex, cognitive decline, depressed, diabetes, dizziness, hearing, high blood pressure, long term memory, lung disease, medical conditions, medical issues, medical news, memory, memory issues, memory loss, neurotransmission, obesity, pain, parkinson s disease, recovery, report, side effects, sleep, sleep apnea, smoking, sore throat.